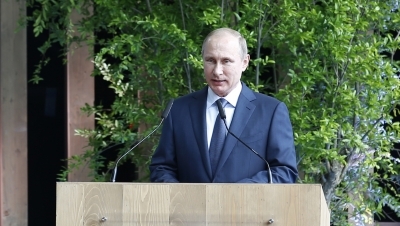 Moscow, July 28 (IANS) Russian President Vladimir Putin on Friday approved the Foreign Ministry’s measure to downsize the number of personnel in US diplomatic and consular missions to 455. Moscow has also suspended from August 1 use by the US embassy the warehouses in Dorozhnaya Street and the property in Serebryany Bor, in response to anti-Russia sanctions bill passed by the US Congress on July 27, a Foreign Ministry statement said. “We suggest the American side should equal the number of diplomatic and technical staff working in the US embassy and the consulates general in St. Petersburg, Yekaterinburg and Vladivostok to the exact number of Russian diplomats and technical staff working in the US before September 1,” TASS news cited the statement as saying. Kremlin Press Secretary Dmitry Peskov told reporters that the measures were approved by the President. The Russian Foreign Ministry also said that Moscow reserved the right for additional restrictive measures, which could have an impact on Washington’s interests, as part of reciprocal steps to US recent policies. Former President Barack Obama in December last year introduced sanctions against Russia and closed two Russian diplomatic properties in New York and Maryland. Access to the properties was closed for the Russian personnel.